With technical genius, the woodcut artist transports viewers with his extraordinary interpretations of place and time. 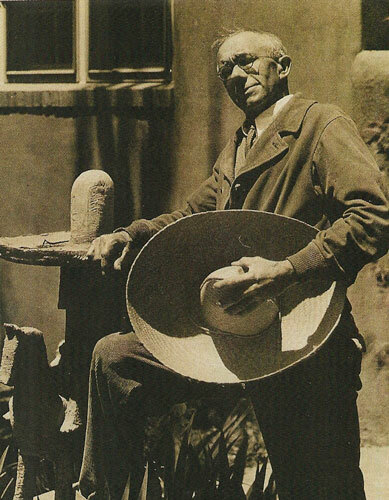 Artist, printmaker Gustave Baumann, Santa Fe, New Mexico, 1932. Timing is everything. I had traveled to Santa Fe, in part to see as many Gustave Baumann prints in person as time would allow. My first stop was The Owings Gallery. No sooner had I walked into their elegant space, than out walked a Baumann print. Nathaniel Owings, the gallery's proprietor was literally handling a bubble-wrapped package to a smiling client, containing a copy of Three Pines. I couldn't have choreographed my visit any better. It turned out that Three Pines was inspired by a grove of conifers that still exists in the town of Chama, two-and-a-half hours from the gallery. Baumann's pictorial genius exedrted such a strong pull that I briefly gave thought to hopping in the car and driving to that very spot to experience the profound connection between nature and artist. Though I decided to stick around the gallery, I marveled at how Baumann's woodcut compelled me to even consider making the 150-mile drive. Such is the power of his art. Gustave Baumann was born in Magdeburg, Germany, in 1881. By the age of 10, his family had relocated to Chicago. After formal training at the Chicago Art Institute, he returned to Germany in 1905 for additional studies, falling in love with the woodcut medium. Though it's the most basic form of printmaking, it's probably the most difficult to master. For openers, each color requires the artist to cut a separate block of wood. A typical Baumann print utilizes four to six colors, which often overlap, creating additional colors. Then the artist has to determine in which order to print each block. There are also issues with registration - making sure the blocks align where they're supposed to But perhaps the most difficult skill to become proficient in is the carving of individual elements for the image the artist hopes to create. Once the tiny chisel strips away a section of wood, it's gone forever - there are no second chances with woodcuts. 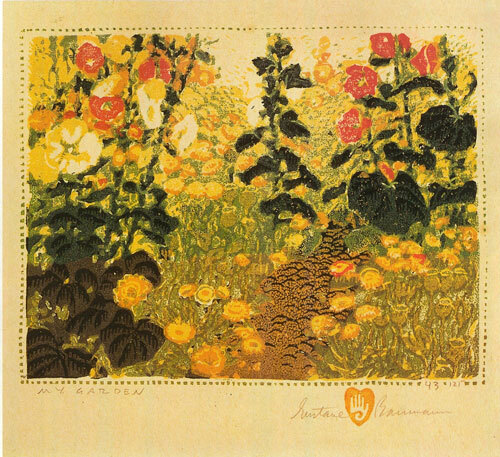 Gustave Baumann, My Garden, 1924, color woodcut, 6"x7.5"
In 1906, Baumann returned to the United States, where he continued to make art, organize exhibitions and remain active in several artist colonies. His artistic breakthrough occured in 1918, while visiting friends in Taos, which was home to a newly emerging art scene. This was the legendary era that revolved around Mabel Dodge Luhan, the New York socialite turned arts impresario, whose salons attracted D. H. Lawrence, Georgia O'Keeffe and Ansel Adams. Though Baumann began to forge connections in Taos, he was reluctant to put down roots due to its art community's elitist nature. Santa Fe, only 70 miles south of Taos, would prove to be the answer. At the time, Santa Fe was culturally less developed than Taos, but far more open-minded in its acceptance of new artists and ideas. Soon, Baumann was invited to show his early woodcuts at the recently opened New Mexico Museum of Art in Santa Fe. Upon attending his exhibition, he became enthralled with the local art world and its less rigid hierarchy. Baumann settled permanently in Santa Fe and would remain there for some 50 years. Along with Willard Clark and Norma Bassett Hall, Baumann turned the region into the "woodcut capital of America." With his studio established, Baumann became increasingly fascinated with Native American culture. He made regular visits to neighboring pueblos, observing Indian dances while taking mental notes (cameras and sketch pads were forbidden) of the vivid costumes, headdresses and Kachina figures. Baumann found further inspiration in New Mexico's old adobe homes and churches, distinctive changes of season and impressive natural wonders. He also spent time in Arizona, tapping into the majesty of the Grand Canyon and he Sonoran Desert's remarkable flora, especially the behemoth saguaros and pipe cleaner-thin ocotillos. In later years, Baumann used his carving talents to create wooden puppets for plays he wrote about New Mexico's cultural heritage. But he always returned to his infatuation with woodcuts. Upon his death in 1971, much of his work, including gouaches and many of the actual carved blocks used to create his prints, were donated to the New Mexico Museum of Art. The institution continues to honor Baumann with rotating exhibitions about his life and art. For Baumann aficionados, it is a rquired pilgrimage. 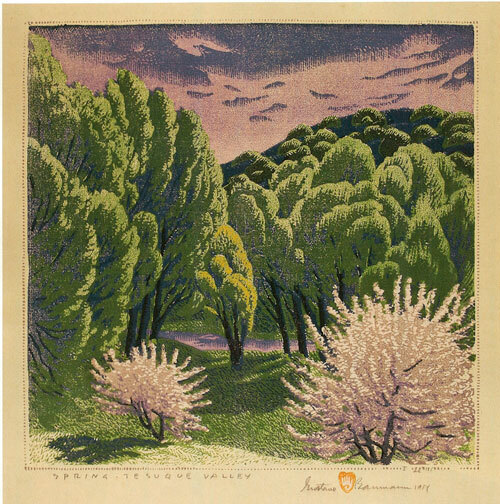 Gustave Baumann, Malapai, color woodblock print, 9"x11"
Back at the gallery, I asked Nat Owings what attracted him to Baumann's work. He answered without hesitation: "Color, composition, and subject matter - the technical component is staggering." His Santa Fe colleague and Baumann dealer, Richard Lampert, of Zaplin-Lampert Gallery, concurred. "He saw colors most of us could never imagine," said Lampert. For me, Baumann's iconography transports you. If his pieces capture a place I have once experienced - like the desert panorama of Palo Verde and Ocotea - looking at the art brings me back in an instant. If it portrays a scene I have never witnessed but wish I had - like San Geronimo - Taos, the print flies me there like a magic kilm rug. At the end of the day, though, Baumann prints are more about a state of mind than an actual place. Owings led me to a small side gallery. An array of perhaps a dozen Baumanns materialized. Some of the artist's greatest prints were on display, including Procession - the silver-leafed work that graces the cover of the standard text on the artist, Gustave Baumann: Nearer to Art. I also noticed that many of the prints were housed in harmonious frames designed by the artist. Owings explained that whether a print was in an original Baumann frame or a reproduction, it bore little impact on its price. As my eyes did a lap around the room, the collector in me became curious as to how the art market evaluates the work. Prices for Baumann have been going up, but at nowhere near the explosive rate of blue-chip contemporary art. The Owings Gallery got involved with his work in 1985, paying between $300 and $600 per print, and selling them for $1,200. A year later, the gallery mounted it first show, priced the work between $2,500 and $5,000, sold everything and never looked back. Owings offered an explanation of the current Baumann market. Prints are basically placed into three groups. The first consists of attractive but leser-known examples such as Malapai, which are priced between $10,000 and $12,000. The next category are images the public is familiar with because they are frequently reproduced, such as Sanctuario Chimayo or Old Santa Fe. This group runs $14,000 to $18,000. Finally, there are the true masterpieces, such as Cholla and Sahuaro, Procession (both blue and silver versions) and Grand Canyon. Plan on spending $20,000 to $30,000 for one of these gems. 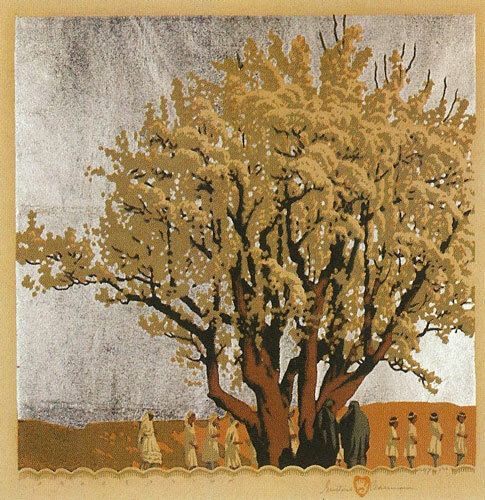 Gustave Baumann, Procession, color woodblock print, 13.75"x13"
The artist's auction market is a bit spotty. Occasionally there are true bargains to be had. In 2011, at the annual Coeur d'Alene Art Auction in Reno, the print, Superstition Mountain, in good condition, brought $5,850 Though I'd place this image in the hypothetical first group, from above, it offered hope to the collector with a limited budget. Other sources for Baumann prints include the annual IFPDA Print Fair in Manhattan and some of the smaller regional auction houses. The future of the Gustave Baumann market appears to be orderly growth, with the top images likely to distance themselves from the pack at an exponential rate. Inevitably, once a major New York museum decides to put together a retrospective, the key images will be difficult to find at any price. That's because Baumann tends to be a "collector's artist." Those who acquire the work buy it for love and rarely sell - except to upgrade. On the other hand, who cares what they will eventually be worth. All I knew was that after walking out of the current Baumann show at the New Mexico Museum of Art, I felt alive. 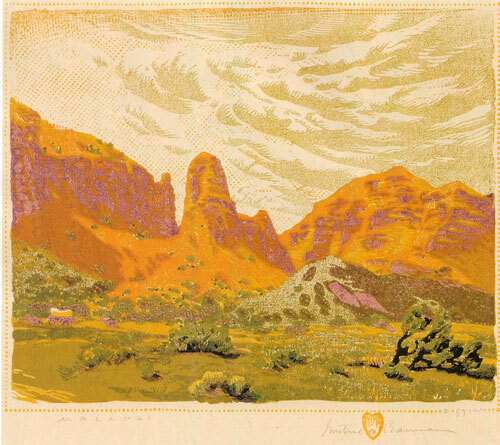 Gustave Baumann, Spring - Tesuque Valley, 1953 (subsequent edition 1954), color woodcut, 13"x12.5"
Richard Polsky (www.richardpolsky.com) is the author of The Art Prophets, a book about visionary art dealers. He's based in Sausalito, California.